Opening hours: 6:30 a.m. - 5:30 p.m. In the heart of the city, the present Cathedral stands on top of a former Constantinian Palace. 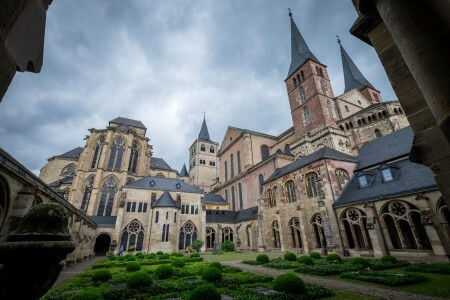 After Constantine's last visit to Trier in A.D. 328/9, the palace was leveled in 330 and replaced by the largest Christian church in Antiquity, about four times as big as the present-day church and covering the area of the Cathedral and the Church of Our Lady, the Cathedral Square, the adjoining garden, and the houses almost up to the market. 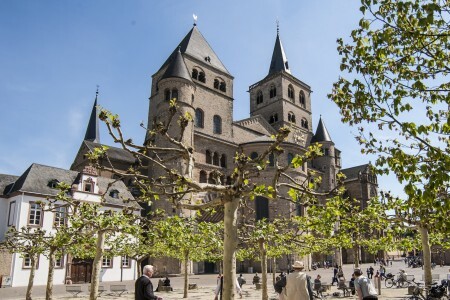 Please note: During the services and concerts it is not possible to visit the cathedral! 04/21/2019: 06:30 a.m. - 6:00 p.m.
04/22/2019: 06:30 a.m. - 6:00 p.m.
04/23/2019: 06:30 a.m. - 6:00 p.m.
04/24/2019: 06:30 a.m. - 6:00 p.m.
04/25/2019: 06:30 a.m. - 6:00 p.m.
04/26/2019: 06:30 a.m. - 6:00 p.m.
04/27/2019: 06:30 a.m. - 6:00 p.m.
04/28/2019: 06:30 a.m. - 6:00 p.m.
04/29/2019: 06:30 a.m. - 6:00 p.m.
04/30/2019: 06:30 a.m. - 6:00 p.m.
05/01/2019: 06:30 a.m. - 6:00 p.m.
05/02/2019: 06:30 a.m. - 6:00 p.m.
05/03/2019: 06:30 a.m. - 6:00 p.m.
05/04/2019: 06:30 a.m. - 6:00 p.m.
05/05/2019: 06:30 a.m. - 6:00 p.m.
05/06/2019: 06:30 a.m. - 6:00 p.m.
05/07/2019: 06:30 a.m. - 6:00 p.m.
05/08/2019: 06:30 a.m. - 6:00 p.m.
05/09/2019: 06:30 a.m. - 6:00 p.m.
05/10/2019: 06:30 a.m. - 6:00 p.m.
05/11/2019: 06:30 a.m. - 6:00 p.m.
05/12/2019: 06:30 a.m. - 6:00 p.m.
05/13/2019: 06:30 a.m. - 6:00 p.m.
05/14/2019: 06:30 a.m. - 6:00 p.m.
05/15/2019: 06:30 a.m. - 6:00 p.m.
05/16/2019: 06:30 a.m. - 6:00 p.m.
05/17/2019: 06:30 a.m. - 6:00 p.m.
05/18/2019: 06:30 a.m. - 6:00 p.m.
05/19/2019: 06:30 a.m. - 6:00 p.m.
05/20/2019: 06:30 a.m. - 6:00 p.m.
05/21/2019: 06:30 a.m. - 6:00 p.m.
05/22/2019: 06:30 a.m. - 6:00 p.m.
05/23/2019: 06:30 a.m. - 6:00 p.m.
05/24/2019: 06:30 a.m. - 6:00 p.m.
05/25/2019: 06:30 a.m. - 6:00 p.m.
05/26/2019: 06:30 a.m. - 6:00 p.m.
05/27/2019: 06:30 a.m. - 6:00 p.m.
05/28/2019: 06:30 a.m. - 6:00 p.m.
05/29/2019: 06:30 a.m. - 6:00 p.m.
05/30/2019: 06:30 a.m. - 6:00 p.m.
05/31/2019: 06:30 a.m. - 6:00 p.m.
06/01/2019: 06:30 a.m. - 6:00 p.m.
06/02/2019: 06:30 a.m. - 6:00 p.m.
06/03/2019: 06:30 a.m. - 6:00 p.m.
06/04/2019: 06:30 a.m. - 6:00 p.m.
06/05/2019: 06:30 a.m. - 6:00 p.m.
06/06/2019: 06:30 a.m. - 6:00 p.m.
06/07/2019: 06:30 a.m. - 6:00 p.m.
06/08/2019: 06:30 a.m. - 9:00 a.m. & 12:00 p.m. - 6:00 p.m.
06/09/2019: 06:30 a.m. - 6:00 p.m.